A familiar sight at 626 Night Market events is watching the workers at vendor Takoyaki Tanota pouring batter into molded pans, adding minced octopus, pickled ginger, green onions and tempura scraps (tenkasu), and then deftly flipping the mix to cook and shape them into perfectly rounded takoyaki balls. 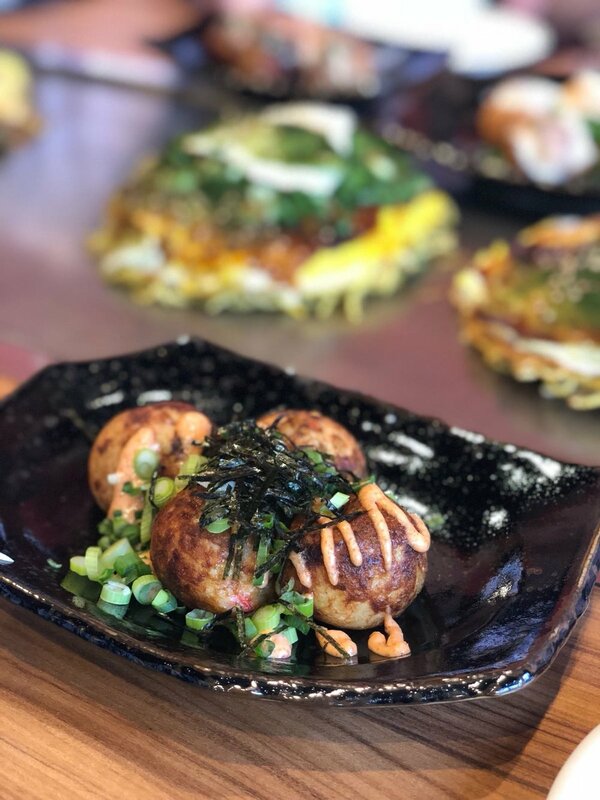 From humble beginnings selling takoyaki out of a food truck and at festival events, Takoyaki Tanota announced a physical location that is now open in the Japanese Village Plaza in Little Tokyo, Los Angeles. The new restaurant is a collaboration with Chinchikurin in a shared restaurant space, a chain in Japan known for its Hiroshima-style okonomiyaki. Okonomiyaki is a savory pancake made with flour, cabbage, eggs, tenkasu, pork belly slices and topped with a variety of condiments like Japanese mayonnaise, okonomiyaki sauce, dried seaweed, and dried bonito flakes. If you love Japanese food, you can order both takoyaki and okonomiyaki in one place! The restaurant features a take out window where you can still watch takoyaki being made fresh and order to-go to bring home. Inside, you can choose to sit at the takoyaki counter or the okonomiyaki bar to watch the chefs preparing the food. If you opt for a table, each of them have a built-in teppan grill to keep your food warm while you eat. CAUTION: the teppan grills may already be on and be hot! The 626 team tried the original and the parmesan truffle takoyaki, the Chinchikurinyaki, the B&C (basil and cheese) and the classic okonomiyaki, and the tsukemen (cold dipping noodles). I personally enjoyed the parmesan truffle takoyaki, the B&C okonomiyaki and the tsukemen. The takoyaki was hot and fluffy with succulent pieces of octopus inside. Although an odd fusion of East meets West, the parmesan truffle flavor greatly enhanced the takoyaki instead of being overwhelming. The ingredients in the okonomiyaki were layered in the Hiroshima style like stacked pancakes compared to mixed together in Osaka style, which you can see when you cut into it with a small, shovel-shaped teppanyaki spatula. We chose the grilled noodles in our okonomiyaki but it felt a bit hard, so maybe next time we'll get the soft noodles. Don't forget to add the special okonomiyaki sauce and Japanese mayo! Since I'm a cheese lover, the parmesan truffle takoyaki and basil and cheese okonomiyaki were a no-brainer but the tsukemen was a pleasant surprise! The noodles were nicely firm and you dip them, the spinach, cabbage, tomatoes, alfalfa sprouts and grilled beef into a savory bonito and shoyu (Katsuojyogu) sauce with sesame seeds. You can increase the spiciness level of the sauce but we chose the lowest level. The team begged Mr. Takeo, the owner of Takoyaki Tanota, to bring the parmesan truffle takoyaki to 626 Night Market since we've never seen it before but he says he'll have to think about it. Maybe it'll be a secret menu item! Congrats to our Night Market family and we wish our vendor Takoyaki Tanota much success! They will also participate at all of our 626 and OC Night Market events this 2018 season. Stalk them on Facebook, Instagram and Twitter. If you visit their new place, let us know in the comments which items were your favorites! The original takoyaki from Takotaki Tanota. The B&C (basil and cheese) okonomiyaki with an egg from Chinchikurin.